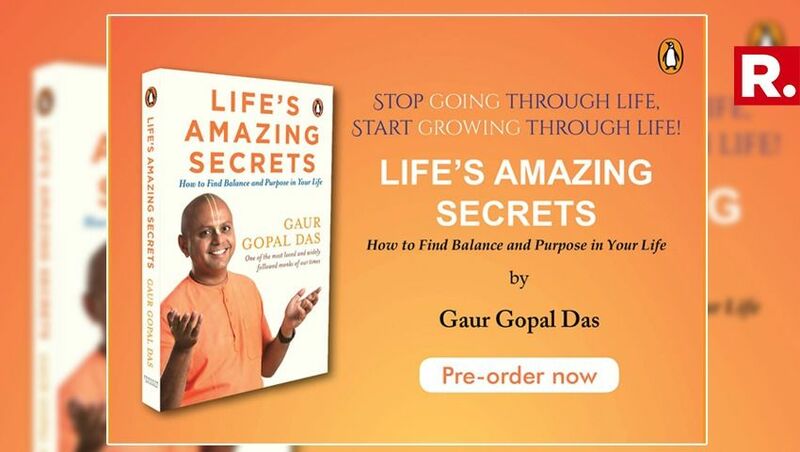 Gaur Gopal Das is considered as one of the most influential figures of International Society of Krishna Consciousness (ISKCON) and he is all set to release his first book titled 'Life's Amazing Secrets: How to Find Balance and Purpose in Your Life'. Mark the dates as the book is scheduled to release on October 8, 2018. The book distils his experiences and lessons about life into a light-hearted, thought-provoking book that would help the readers align themselves with the life that they want to live. It explores the issues such as tackling relationships better, discovering your true self, understanding how to do well at work, and even how to give back to the world. He shows a way to make the life worth living and worth loving. Gaur Gopal Das takes the reader on an unforgettable journey with his precious insights on the everyday issues of life. Gaur Gopal Das is one of the most sought-after personal coach and a lifestyle guru known for his humorous anecdotes and simple pieces of advice about life and living. After studying Engineering in 1995 and a brief stint with Hewlett Packard, he decided to upgrade his career to be a life coach. Consequently, in the year 1996, he joined ISKCON and has been associated with ISKON ever since. A number of Corporate firms have not been an exception in his areas of continual help and guidance. Since 2016, he gained much fame after spreading his messages online. He was awarded the 2016 Rotary International's Super Achiever Award for outstanding contribution in the field of spirituality and inspiration. The book is available for pre-order.